I have recently reach 500 followers on Twitter and I asked you what kind of map you wanna see for celebrating it. You chose a city map so here it is. I had a lot of fun to draw this town and to write the story. I hope you enjoy it as much than I do. As always, I would like to thank all my awesome supporters on Patreon. 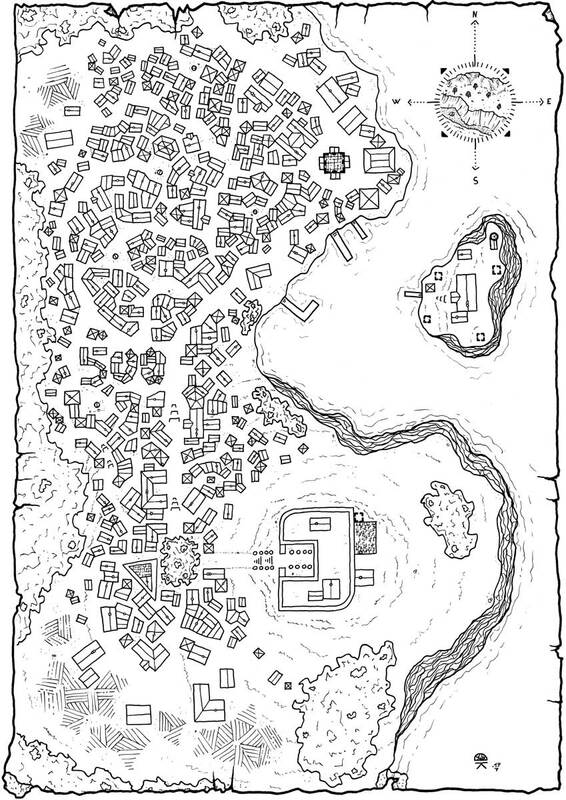 It’s thanks to them that I’m able to offer you another cool fantasy map. Situated on an island beyond the purple sea, the ancient city of Newar is colorfull and endowed with an impressive cultural diversity. This city is a true open-air market. The spices’ scents and otherfoodstuffs’ scents from the many stalls are mixed with the winds to create intoxicating exotic perfumes. The city bustles with activity during the day and it is pleasant to stroll through the lively streets. Newar is known by merchants from all around the world and the picturesque stories they tell when they return home attract other curious travelers. The influx of these rich merchants quickly stirred up the lust of smugglers and crooks of all kinds. The city takes on a whole different face at night, much darker and it becomes dangerous to walk on the streets at the risk of being stripped. The docks turn into a real cut throat and the most dirty business are planned over there. The Jalpexun’s temple dominates the whole city from the top of the hill, this imposing building is the refuge of a thousands years old monastic order. The monks, commonly known as the Pex, have for mission to protect a sumptuous collection of five hundred statues. According to the Pex Holly Scriptures, these statues are the remains of the mighty army of the mage Jalpexun. The legendary hero of the Great War against the Shadows that followed the creation of the world. He controlled this gigantic army of stone warriors thanks to the power of three mystical rings. The Holly Scriptures predict the coming of an elect, a sorcerer’s son, having inherited the three Jalpexun’s rings. Only him will be able to understand all the mysteries of the temple and thus enjoy a great power. While the world darkens at a crazy speed, the monks desperately wait for the coming of this elect. However, the time is now because the shadows are increasingly menacing and they will be back soon.